Clearly nothing went wrong as I decided to be brave enough to share it with you dear readers. 🙂 The only thing worth noting is that it is not a soup for you if you do not like flavour of celeriac as despite adding only a smallish piece, its flavour really comes through. That really is the only warning, I promise you. 🙂 Anyways, if celeriac is not your thing, simply leave it out. Don’t be to hung up on the quantity of veg. I suggested 2 medium leeks and potatoes, no need to use scales. If your veg is slightly larger and you might need a bit more liquid, go for it. Add splash more of stock/water, adjust seasoning and I’m sure your soup will be lovely. Soup making is not baking (pardon unintentional rhyme here), you don’t need to be super precise to get wonderful results. 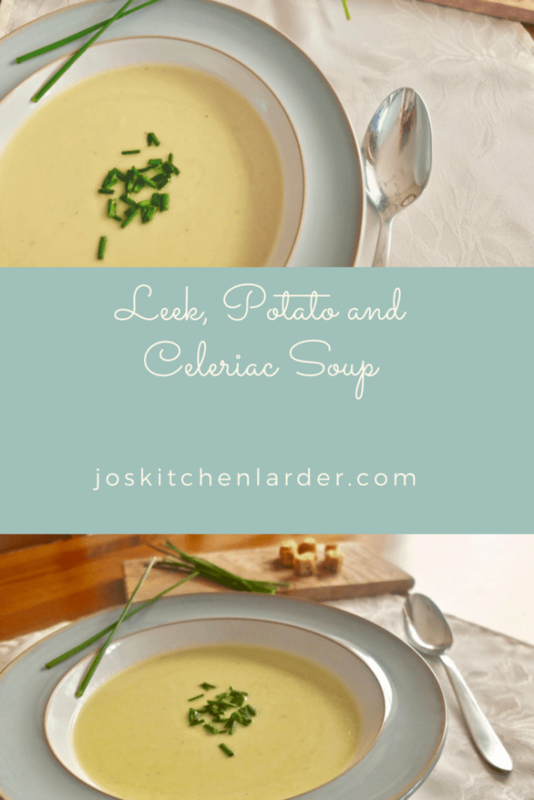 I encourage you to go for it and make this Leek, Potato and Celeriac Soup your own! It really is a wonderful, tasty, warm your cockles, soothe your soul kind of soup and I hope you like it as much as I do. Thank you for stopping by and please do leave a comment as I’d love to know what you thought about my recipe. Start with preparing your veg. Discard the very top of the leeks (dark green part). Halve and clean your leeks thoroughly, getting rid of all the grit. Slice thinly. Peel, wash and cube potatoes. Peel wash and cube celeriac. Melt butter in a large pan. Add prepared leeks and cook until softened but not coloured (about 5 min). Add potatoes and celeriac and continue cooking for another 2-3 min. Add stock, bit of salt and pepper and cover. Simmer until all the veg, especially celeriac (which takes the longest) is tender. Take the soup off the hob and puree to desired consistency using hand blender. I like it really smooth and silky but you may want some texture to it. Add creme fraiche, adjust seasoning and quickly blend again. Serve sprinkled with chopped chives and some croutons. If you are soup lover and maker and not vegetarian you might want to make your own chicken stock too. Feel free to check out my guide on How To Make Chicken Stock in Instant Pot (with instructions for hob/stovetop users too). Thanks, Jo. This recipe was simple and delicious! I never realised how much I like celeriac! 😀 With the box of organic veg I was given, this recipe was just what I was looking for. This looks delicious! But FYI, your instructions mention celeriac once and never says when to include the leeks. I assume the leeks come first and the potatoes and celeriac second, but it seems like something you may want to amend! Love leek and potato soup and I’m pretty sure I’d like your celeriac addition. I haven’t had celeriac in far too long, but I do like it. I find it really hard to post soup recipes as most of my soups are an ad hoc melange of whatever I happen to have to hand. I think adding the celeriac is a great idea then again I would as I love celeriac! I do like soups that use up the bits and pieces in the fridge a great way to avoid food waste. Just to let you know I will be guest hosting the #CookBlogShare linky this week over at Recipes Made Easy and I would love it if you pop over and linky up another recipe. Hello Jacqui, I really hate throwing things out hence this soup was enhanced with celeriac which worked beautifully. Thank you so much for the invite to another #CookBlogShare 🙂 I will definitely pop over and link another recipe later this week. Have a great week! It is a bit like marmite isn’t it? I love it though😍 Well done tricking the family. Mine don’t even knows what goes in their food half the time 😂 and it seems to work. I disguise it, they eat it and like it. Everyone’s happy 😊 Happy to link up. Have a great Easter! I love leek and potato soups. They are just so creamy before you even add any extra cream and I love the sound of the celeriac in this one. I am definitely a celeriac fan and it must go so well with the leeks and potato. Thank you for sharing with #CookOnceEatTwice!